When it comes to CI\CD, every component of the business application has equal importance. As the core of any application, the database is one the most complex components due to the vastness of the data it holds and business rules that are implemented to achieve complex business functionalities. Often, databases lag behind during new releases; to prevent this, database performance monitoring and review needs to happen as early as possible to prevent expensive mistakes. If this is a manual process, it slows down releases as managing multiple database components is time consuming. This article will walk you through the process for database performance monitoring, the review of different db components, and how this process can be automated. When a change in a code is performed by any team member — regardless of the technology involved–integrity of all related code must be confirmed to be working per expectations (even in cases where the change is tiny). Understanding how changes to database objects can make an impact on deliverables certainly helps in the database performance monitoring and review process. Let’s take a look at some important objects and areas in a database that you definitely need to keep track of and how to automate the review process as well. An enforced, consistent policy for naming convention will help you automate design changes across multiple environments easily. What's more, using proper object names for each type of data will avoid confusion. So, for example, tables, views and materialized views (MVs) should be easily differentiated simply by looking at their name. Keeping tabs on who has access to what in the database, helps to make sure that unwanted access is not granted to just anyone. On occasion, someone may be granted broader permissions (e.g. to check if the code is working fine on another environment), but it's just as important to remember to revoke these permissions afterwards. Failure to stay on top of the roles and permissions to the database could potentially cause security and deployment errors. An updated "inventory" of users and their permissions must be maintained to avoid such issues. In the era of the cloud, data and databases are often spread out on multiple on-prem and cloud locations. For example, one of your database may be on Amazon, another may be from a different service provider, and you may have applications or users around the world connecting to your databases and accessing data. You need to keep control of who, what, and how connections occur to your database. Making sure that connection strings, DB links, users, and applications all have proper permissions and monitoring all activity is essential to completely eliminate any malicious connection source. Tables and other data-storage structures must be created with precision, ensuring the potential horizontal and vertical growth of the data. A good table design can make sure, for example, that proper primary keys, indexes, foreign keys, and constraints are enforced. Redundant indexes are not created because, rather than improving performance, these will degrade DMLs. Most of your application’s functionality may be implemented via database procedures, functions, triggers, and packages. A preferable design will have all related functionality packages and all source objects kept together inside a single package as much possible. In this way, you can be sure which code needs to be reviewed if you decide to make a change. Proper usage of source-code implementation also improves data security by only allowing changes to occur through the procedures; this ensures that no ad hoc changes are allowed. From DDL to DML, all such operations result in change to your data or data model that may cause big data corruption or security and compliance issues. Hence, it is very important that all operations that make changes to your data are reviewed and properly monitored from the initial design phase to production deployment. You will also need to have proper auditing of transactions as well as maintain a transaction history to track and recover from any unwanted changes. All important components together build up a very robust database system. However, as there are many, keeping pace with other application components for continuous delivery (CD) becomes extremely difficult due to the complexity of how database objects are integrated together with multiple dependencies. Most importantly, data is the main part that fails on continuous delivery when it is not handled properly. Thus, it is critical that your database review process is in top shape. Companies are becoming more cloud-centric, managing their data globally over network connections. The increased number of security threats and data breaches has created new challenges for companies and DBAs to meet growing regulatory and compliance needs. Unlike applications, databases face a different risk due to the sensitivity of data. With databases being accessed by many authenticated users, often from around the globe, tracking and automating database changes is crucial. All database changes, including administrative, DML transactions, or even SELECT statements, need to be monitored closely to ensure compliance with any audit and security policies. Using version control and history database auditing tools is a sure way to promise that changes are well-documented. Defining roles and permissions and what type of changes can be made by each will further help maintain the integrity of the code. When your database serves data for multiple applications and people around the world, you need to implement very tight security via rules and policies as well as monitor how data is flowing between multiple systems. You need to properly protect and monitor data in order to identify malicious activities and threats, as vulnerable areas can cause security breaches. Prevention is the best medicine. Putting the proper measures in place to stop breaches from even happening in the first place, by way of enforcing policies on data changes and integrity, will help keep potential unauthorized changes at bay. If a breach does occur, the ability to stop it, reverse it and alert all relevant teams is crucial. Monitoring data vulnerability helps companies take early action to protect their mission-critical data. Doing so manually will push back deliverables as well as increase time to market, hence you need a tool that provides single-window monitoring, configuration, and administration of all security policies being utilized to protect your data. One such tool from Splunk can help monitor data security via an out-of-box or customizable solution that provides data correlations, searches, and visualizations. Users can obtain real-time security statistics on a database and take actions to enable continuous delivery. Sometimes, changes need to be pushed to the production database directly, often in cases of emergencies. The result is that lower environments are often not updated, and any updates pushed upwards from development or testing can override the emergency fix. The plague of configuration drift is widespread, and can have serious fallout. Automatic drift detection, as is available in DBmaestro DevOps Database Platform, helps prevent these mishaps, directing users to the exact point of change in the production database. Automation is the key to success in any development environment, and databases should not be left behind. 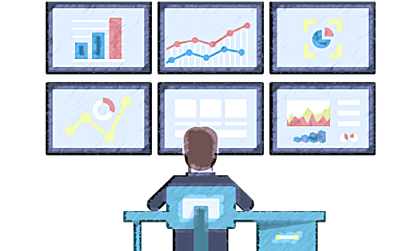 Database performance monitoring and review should also be automated as early as possible because of the complexity associated with database components and the critical role data plays. Using smart DevOps and automation tools , DBAs and developers can be doubly sure that their hard work reaches the market on time. If you enjoyed this post, then you might also be interested in the differences between application and database.